On one of those rare occasions when I could hear myself think (very rare in the cut/thrust, hustle/bustle of the City - although for some strange reason the place seems a bit quieter recently) I pondered upon the subject of my favourite time to eat. With advancing age a big breakfast is out of the question. A midweek dinner usually means indigestion - it’s those big, greasy steaks, you see - and a fuzzy head the next morning. I came to the conclusion that if I could only eat at one time then Saturday lunch would be it. When most people are visiting the DIY Superstore, mowing the lawn or heaven forfend, buying clothes, sensible folk (that’s us) are slowly getting sozzled while scoffing great grub. Well, that’s how it usually goes. 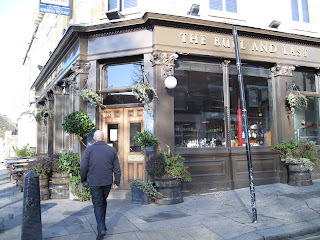 The Bull and Last pub in Highgate hasn’t been open that long but has already garnered great reviews (as has its sister The Prince of Wales in Putney). This would normally be the kiss of death for any place for me but I decided to give it a chance and wandered along last Saturday for a spot of lunch with HS. My initial concerns increased when I saw that all but one of their ales was off. And so it begins I thought when I saw a pile of Scotch Eggs and Sausage Rolls behind the bar. The Harwood Arms cooks them to order I huffed to HS. As it turned out I was just being unusually and extra-curmudgeonly. The Bull and Last is an absolutely terrific gaff. Those Scotch Eggs and Sausage Rolls had just been cooked. 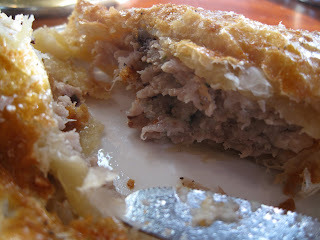 Both were excellent especially the Roll where the buttery, flaky pastry encased good Pork Sausage meat which had been studded with little nuggets of Black Pudding. Such a good idea I’m surprised you don’t see it more often. Our little bar-side amuses finished we rolled up our sleeves to get stuck into the menu proper. This kitchen doesn’t hang around and the first three dishes weren’t long in arriving. 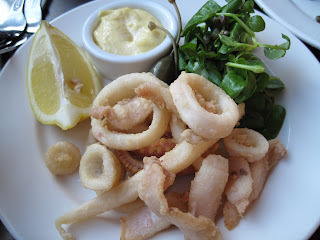 Crispy Squid was indeed, crispy, and very fresh. A pungent Aioli had us using our fingers in the only way that DH know how. Some more Porky (and Ducky) treats came on the Charcuterie board: a silky Liver Parfait was refined but with a pleasingly Offaly kick. A terrine of Belly Pork was little underseasoned but was good and fatty. As were the Rillettes. 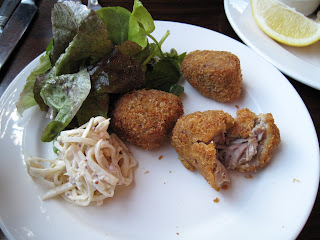 Best of the lot was the Deep Fried Lamb Breast coming on as an English version of the Iberian Croqueta. 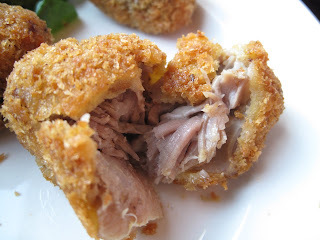 Notably good Lamb had been shredded and breadcrumbed and fried properly so that the coating complemented rather than dominating the whole. Perfect comfort food, then, but done with no little refinement. Perfect ingreients too and, a nice touch here, instead of hiding the provenance of the ingredients in the menu they’re prouly displayed over the bar. Triple cooked chips were up there with the best and had us engaged in one of those unseemly squabbles over the correct and fair distribution of the same. If the friendly and efficient staff hadn’t been quite so busy they would have wondered what on earth was going on. Sad, really quite sad. While taking cinquo minutos we saw other plates of food pass by: Beef Pies with flaky, crusted tops; a big fist of Deep Fried Haddock with more of those chips; doorstep sandwiches; a steaming pot of Moules, this time served with great looking Frites. O-M-G, this kitchen does TWO types of chips. 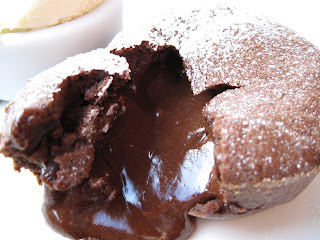 After what had gone before it would have been a major surprise if the puds had been anything other than great. 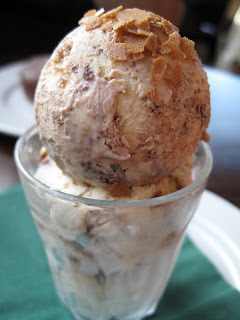 I really liked my Praline and Chocolate Ice Cream. It seems to have just the right texture, HS astutely noted. 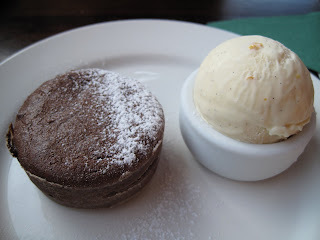 Even better was the Marmalade version with his Chocolate Orange Fondant, both of which had HS going off on one (“it’s sweet, it’s chocolatey, it’s…etc”). Things were beginning to liven up by the time we drained the dregs from a half bottle of Sauterne. The Nappy Valley families who had come for an early lunch had moved on to be replaced by a mixture of locals, dog-walkers and groups of lads devouring big plates of Sausage Rolls and chips. A pretty mixed crowd making for a buzzy yet civilised atmosphere. A model for pubs of the future ? Possibly, but certainly a model pub for today. Other hostelries please take note. I ate there a few weeks ago and thought it was excellent - reminded me of a time when the gastropub revolution felt like a bright new dawn. With a light bfast,my favourite time to eat on the weekend is a copious lunch between 2-3pm and then only some fruit in the evening.Keeps the weight off,and allows you to enjoy a nice meal without doubling up on everything each day of the weekend and staggering back to work on Monday still stuffed. The triple cooked chips are fantastic. I think the Bull and Last really lives up to the hype. all that food looked excellent. 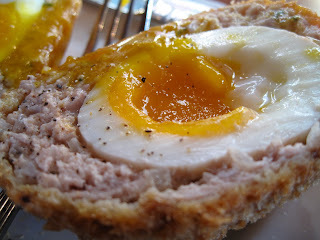 The yolk on the Scotch Egg looked perfect - Thanks for bringing this place to our attention! 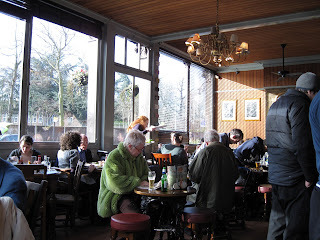 I've regularly visited the Bull since it opened as I live in Tufnell Park, a Saturday afternoon pint of Black sheep and a scotch egg goes down a treat. I went for Sunday lunch yesterday for the first time and unfortunately I was disappointed. It started badly with the barman rudely ignoring me to serve Giles Coren who he made a big fuss over before finding him a table upstairs. I tried doing the same but he advised that they were full which was annoying, food critic or not! I eventually found an empty table and ordered the roast beef. 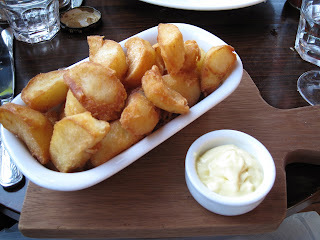 At £15 I thought it was expensive, the beef was good but the 2 roast potatoes I got were like a couple of small rocks. If it was a £6 roast from weather spoons then rock hard roastie’s would have been acceptable, but not at £15. I shall return for scotch eggs and spitfire but may swerve the food. The staff more friendly and the food superior in the Junction tavern around the corner. Sometimes chefx take a break on Sunday or on Monday so maybe the B team was in. No excuse though for poor food. I have to say I've never found a really good Sunday lunch outside Casa DH so I never bother these days preferring to stick to Dim Sum if I go out. Re Giles Coren didn't you know he is a highly respected journalist who got where he is through a combination of talent and hard work and not, I repeat not, because his Dad worked on the same newspaper. No wonder they served him first instead of some Northern oik. I’ve eaten at the Bull and Last on and off over the last 10 years, so jumped at the chance to revisit an old haunt for what many were saying would be a great meal. Booked more than a week in advance. Surprised that there were only two sittings per evening – 6.45 or 9.00, but assured that the arrangement streamlined the kitchen service. Opted for 9pm, though arrived at 7pm, straight from meetings, which we decided would give us time to get merry and settle in. Made ourselves known to the incredibly rude barman, and were told that a few tables by the bar were for drinking. 8pm - people were wandering in, taking laid tables, ordering starters etc. At least half of the eating tables were free. Some had not booked. ‘seatings’ deal is, etc. It gets heated. We’re told that if we book for 9pm, our table will be free at that time only. The seating rule seems to have been forgotten for others. Diners with reservations are also being shown to their tables. Having been there for so long, surely a table should have been offered if earlier dining were suddenly possible. We were kept from a table until after 9pm, were the only diners seated at that time (all others were on their main) and one of the last two tables to order. A waiter apologised, then advised us that when in a restaurant, one will not be given a table if they do not make themselves known. We complained to the same waiter when given the bill, who decided to sit at the table to argue his point…Need I go on? Rude, insolent staff and blatant disregard for our custom and £100+ bill including drinks, completely overshadowed food that was generally on the mark. I'll admit it doesn't sound good and perhaps B&L is suffering from being too popular but there's always two sides to every story. I've been to places where people have complained of rude staff and found them (the staff) to be sweet as pie. In fact I can't think of many places where DH have eaten out where we had any problems with rude staff. Incompetent, possibly, but that's different. Sometimes the service one receives can reflect ones own attitude at the time and I have to say I find the use of the word 'insolent' rather telling. It's a long time since I've heard that word and I hope your use of it was born out of frustration and disappointment rather than sounding like you were chastising your servants. 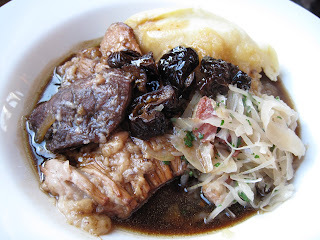 I went with a group of 4 last weekend and attempted to conquer the menu, though I fell in love with my main dish - ox cheek with mint risotto and sublime red wine sauce - and couldn't bare to share. They can do more with a mirapois than the best of the best. Delicious. Can't wait to go back and try something else. Just a warning about google maps....we tried to go to this pub using a google map,which shows the place as being SOUTH of the Kentish Town tube station.Well after a long walk and no pub we realised it is in the opposite direction.So we never made it.But don't use the google map to find this place! I went to the Bull & Last with a party of eight last night. The food was, as described, quite amazing. 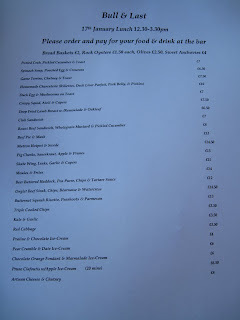 Scotch egg, scallops, pigeon salad, steak, veal, risotto, oysters, bread all outstanding. But the problem was the noise, which reaching shocking volumes by 9:00. I would've had a pudding but couldn't take it any more. Have others found it to be so noisy? I suppose the solution is just to go as early as possible. 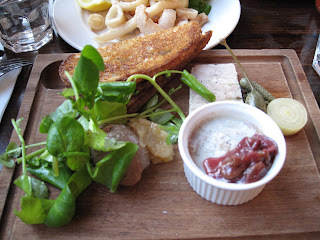 The food this lunchtime was fantastic, and the service was exemplary. Like the Hermanos I am sensitive to snootiness, and thought they pitched it right - happy to be there, and happy to see us. Need to order less food next time. I don't think I'm built for 3 courses any more. I have been there twice so far. First time with a group of 6. Half of which had bad meals. Undercooked chicken and overcooked stringy beef. On that occasion my food was ok but I wwasn't jumping for joy. 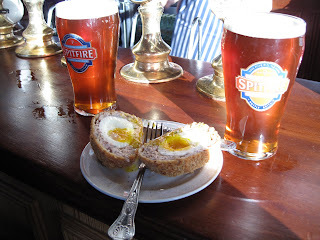 The second time I went I got food poisoning from one of the scotch eggs behind the bar. Won't be eating there again. Great pub for drinking though. Sorry you didn't enjoy, but if you are going to make an accusation of food poisoning, you should probably do it with a name attached to the comment. Only fair don't you think? Had I not called the B&G to let them know after I had recovered, then yes I would agree. I'm not sure how having a name makes a blind bit of difference or makes it anymore fair. Paul. I think if you make a claim of that nature on a public board, it is only fair to let the restaurant know who is making it. I think calling the restaurant afterwards is exactly the right thing to do. Unfortunately, I think a lot restaurants deal with this really badly. How did the B&G react?